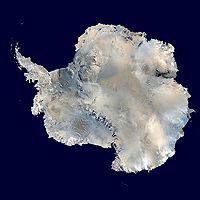 Antarctica (ēac Andnorþa gēhaten) is sē sūþmesta ƿorulddǣl þǣre Eorðe, under-licgende þæm Sūþende þǣre eaxe. Hit licgeþ on þæt Antarctisc eordor of mæstum sūþe healftryndle, eallmæst hālic sūþ Antarctiscum circule, and is ymbhammen þȳ Flotƿege Sūþe. Æt 14.0 millionum km², hit is fīfta-grēatest ƿorulddǣl in grīete æfter Asia, Affrica, Norðamerica, and Sūðamerica. Ymbe 98% of Antarctice is þeahte īse, hƿilc medemeum æt læst 1.6 km in þiccenesse. Antarctica, medemeum, is þæt cealdest, drygest, and ƿinlicest ƿorulddǣl, and hæfeþ þære hēahest medemene uphafennesse of eallum ƿorulddǣlum. Antarctica is bemæt drūgoþ, mid gēarlicum ƿætan bēonde ǣnlīc 200 mm ymbe sælande and micelum lǣsƿe inlande. Þær is nān unlæne mann sætan, būtan 1,000 tō 5,000 manna eftsitteaþ þurh ūt þǣm gēare æt þā leornunge gesteald sceaterede ymbe þǣm ƿorulddǣle. Ǣnlīc ceald-gerādum plantan and dēoru þolaþ þǣr, ymbhabbende penguinas, sēolas, nematōdas, tardigradas, mītan, manigum algae cynd and ōþer smældēoru, and ceald-eorðan plantas. Man nīwanost wende þisne tramet on þǣre 09:42 tīde þæs 22 Solmōnaþ 2019.